Discover How We Built a Facebook Page With 10.030 Followers in 22 Days. "After reading the first 20 pages or so I was already making changes..."
"I'm going to use this daily"
"If you have been looking around the Forum for a solid guide... Look no further." *These reviews are a sample from the WarriorForum where this report has sold more than 600+ copies already. Does this work in my niche? This strategy works for all niches allowed on Facebook. We have used it in several, and our research is also based on some of most successful pages on the platform. Yes. We offer a 30-day money back guarantee. If you for some reason are not one-hundred-percent happy with the product, just send me an email and I will refund 100% of your investment. No questions asked! How much do I have to spend after buying the report? Nothing if you don't want to. You can get started completely for free. The report covers free fan-generation techniques as well as paid ones. However, if you want to speed up your results, we recommend you are prepared to spend a bit on advertising. Does the report cover X? In short, this report covers all the critical elements of building a successful Facebook page. This includes: choosing the right page type and name, correct page setup, getting your first fans (for free or with paid ads), viral growth hacks, content strategies, monetization, how to manage a high-traffic page, insight and competition analysis, and much more. One warrior member saw results in just 12 hours after investing in a copy of this report. Of course, we can't guarantee your results will be as fast. I am interested of newest version of this product. Thank you for your interest in my report. Invest in the report here on this page and you'll get the latest version. You will also get free access to any future versions of the report. I see the reviews are from 2013. This works as well today as it did then? Yes, the report has been updated to reflect any changes. All customers also receive any future updates to the report. Does this work with non-English language traffic? I'm in Brazil and our language is Portuguese. Yes. This works for non-English speaking websites and traffic. Yes, that is what the report is all about. Thanks for reply, I just bought your report and it is very nice and useful! Thank you for investing in my report, fastcooler. I'm glad you found it valuable. Any discount for newbie ? Seriously??? You want a discount off of $12? Amazing! Thank you for your interest in my WSO. This report is already discounted as a special offer for warriors. If you put the contents inside the report to use, it should be worth a lot more than the current price. Is this niche specific? Will it work on any niche I choose? This works for any niche that is accepted on Facebook. heloo sir where the udate 2018?? Can you send me an update (WF "p307ig") ? Can you please send me the download link or shall I buy it ? No need to buy as you are already a customer. Upgrades are free. i just purchase your product, but i cant get access to download the guide book, pls send me the new download link. Hi, I have purchased the 2017 version. Do you provide me a free upgrade to your 2018 version? Yes. All updates are free. I just sent you a PM. I have a brand new fan page in gaming niche with 0 followers. can your guide help me grow to 1000 followers in 30 days without ads? Yes. Getting 1000 followers is definitely possible if you apply the strategies in the report. More is also possible. But it depends on a lot of factors. If you are not satisfied with the result, you can use our money back guarantee within 30 days. I have 3 pages and i like to know how to get more followers... How? Send me a link too. Interested in buying. Thanks! The buy now link should be present here on this page. Facebook is changing all the time, but so are we! Facebook and the report now reflects this. - as well as free access to any future updates. ok i red all reviews, and what will be the average growth rate for any niche if followed correctly? and any review copy for this one? Sadly, I cannot give you an average growth rate as it would depend on too many factors like niche, how you apply the strategies, time spend working, etc. There are plenty of reviews in this thread from fellow warriors who have seen results on their pages. What amount of advertising budget do you recommend to start with? This is paid and not free fan traffic correct? You will learn both free and paid methods in the report so you can get started with any advertising budget. I didnt get any resource after buying this?. Can you please send me the link to buy? how much money spend to get 10k likes fanpage recipes ? to give you a clear number. will learn both free and paid fan generation methods. HI, Just purchased the product and it's asking me to join in order to get the product. I don't want to join, I just want the product. How can I get it now? UPDATE Got an email with a download link. All good! HI, Just purchased the product and it's asking me to join in order to get the product. I don't want to join, I just want the product. How can I get it now? heloo do you have case studies using this course to make money with adsense? Several case studies are included in this offer. Unfortunately, none of them are specifically for AdSense sites. However, you can still learn from them and tweak a bit to use the methods with AdSense sites. Also, is the report about boosting your pages and paying for ads as the main source of traffic? Do we have to make our own content for the pages? As you will learn in the report, recycled content is not doing well on Facebook. This means you need to create at least some of the content yourself. However, the report shows you how to come up with ideas that work very well on Facebook - and also how to create the actual content with ease. Just purchased. There are a bunch of other products that are recommended before you get to the actual download link of the PDF. The report will teach you both paid and free strategies. What you use as your main source of traffic is up to you. Thank you for investing in my WSO. I hope you find it valuable. The upsell is a bundle with my other WSOs, training material, resources, software etc. It is in no way required for this WSO to work. Ok cool. And if i am already running engagement ads will this mess with those? No, I do not see how that would be a problem. I sent you a pm because i bought your wso last year and didn't get an update. Can you please answer my message, thanks a lot. My payment details are attached via pm. Is there a limit to the number of fb pages you can create? after i'am implemented this course my new page get 12000 likers in 23 days and what i can do next sir thx before? That's a great start feedbackers1! Nice results. Now you can start using your audience. It should all be in the report. you focus on one (or at least a few) if you are just starting out. In September 2016 someone asked if they could hire you to implement your strategies for them and you replied that you were no able to offer that as a service at that time. Any chance that may have changed, presently? I'd be interested in paying someone do this for me. Thank you for investing in my WSO. Hope you are enjoying it. Fan growth depends on a lot of factors so I can't give you any guarantee. But it should be possible if you are ready to work and have the right strategy. Some Facebook pages are growing much faster than this. #2 Case Study: What Makes A Good Facebook Page? Hey there! Do you think that this would be good for freelance writing niche. I am actually on upwork and would like to bring people to my page. Idk if you have ever had anyone use it for a writing niche. Also too, I do want to learn cpa down the line and I saw a review that said something about cpa. Can this method be used for cpa offers as well. Seems like one could make a killing that way. I know I did comment on this thread before, I was working on another project then and I wanted to clarify my question. I have previously purchased Fb community reloaded in 2015... Would this entitle me to a discount on this product. I do not have any personal experience with the freelance writing niche, but with the right angle I believe you can make it work - if you already have a FB page I'm confident you can use the report to improve your reach. You can also use strategies from the report to promote CPA offers - if done right. There's a section in the report about this. how much investment is required to run this course? The report covers free fan-generation techniques as well as paid ones. Can I use this ebook for the country not speaking english?? There are plenty of Facebook pages with non-English speaking audiences. heloo can i use monetize adsense with your course? Yes, absolutely. If you have a website with AdSense you can use it with this course. Basically you are going to build better pages that naturally grow based on the readers interest. But also (and very important) tie into opportunities to sell. You will have to read and test within the first 3 days but as long as you have a revenue stream or several tied to it you should do great. Thank you for the review darrenmonroe! Means a lot. WSO looks great. My question is can this be used to grow an audience and then use that traffic and redirect them to a website? Also, how much will be needed to invest in this method. Thanks. Yes, that is exactly what you are going to learn in this report: How to grow an audience that you can use to send traffic to any website. You do not need to invest anything beyond the report. If you have an advertising budget you may be able to speed things up, but it is not necessary. Could this be used in the IM niche, specifically the email list building niche? Yes this can be used in the IM niche. Also the email list building sub-niche. Can this is be used for any niche ? can this be used and helpful for a complex niche like jewelry / fashion clothing ? This can be used for all niches allowed on Facebook. So yes, you can use it for jewelry and/or fashion niches. Hi can your book help me grow my acting / modeling page with 1000 new page likes in 30 days ? Is it possible to pay you to manage my Facebook pages using these methods? I'm not able to offer this service at the moment. Sorry. My Facebook ads account was flagged and suspended and I don't know whether they will ever unsuspend me. I have asked them why and no response. So can I still use your course to get traffic? Good news. Facebook just reactivated my ads account, but I would still be interested in knowing the answer. Is this going to teach you how to create ads on facebook ? like how to get roi etc.. ? Yes, the report will show you how to create Facebook Ads. Is this totally up to date? Yes, the report is updated for the current state of Facebook. I also update the report whenever critical changes happen. Could this method be used to solely promote cpa? an if so can this be done direct linking to relevant landers or would we need our own sites with say banners. Also regarding traffic,if we go the free route would we get enough traffic to promote straight off the bat? or is this something thats going to take a while to grow. You can use the strategies inside FBCommmunity to promote CPA offers. However, for some offers you may have to create your own landers as Facebook sometimes blocks certain URLs. You will be able to see results relatively fast. We've had warriors report results in as little as 12 hours after investing in the report. Of course it will take a bit more than that to really see big growth. My strategies are best when applied over time. Hi Mathias, sent you a PM. would this be good for a multi niche shopify store. Yes. There are plenty of successful stores on Facebook. Its wierd i'm member of war room tho but i reach this thread when watched FB ads. I'm just right need this at very moment since recently i just build some FB fanpage for my product. Just purchased this super cheap wso, thanks Mathias will read it and let you know. I hope you are enjoying the report! I'm glad you found it in a time of need. Roughly how many hours per day did you have to put into that page to get it 10K fans in 22 days? Was that with or without spending on ads? If it was done with ad spend, how much longer would it have taken without? So it's hard to give exact numbers as it will vary from person to person. I did spend some money on ads to speed up the 10k fans - the first fans are usually the hardest so it can be beneficial to pay a bit for them. However, this is not a requirement and I also show free methods inside the report. Using purely free methods is obviously slower than paying (it always is). But it is definitely doable and I have also grown pages into the thousands without paying for ads at all. I know this may not be the answer you were looking for, but the truth is: it always depends on the situation. I am ordering it right away. Will leave a review after i look over it. Thank you for investing in my WSO! I'm interested to know how the recent changes last weekend with Facebook will impact the training in your course if at all? What changes are are thinking about? There's always a lot going on with Facebook, and I keep a close eye on their newsroom to make sure the training is as up-to-date as it can be. is 1000 bucks possible within a week? It all depends on your level of ambition. I can of course not make any guarantees about this. wish to purchase but when i click the link it doesn't work for me. PM sent thanks! The buy button should work now. I just tested it. Thank you for investing in my WSO. Wishing you the very best of luck with your project! Several warriors have already posted their reviews in this thread. Including some people who paid full price for the product. We can apply the same on running fb pages? as i dont want to make more wants to push my current one. Yes, these strategies can work wonders on existing pages. You can just skip the first part about page creation if you already have a Facebook page. No. Several warriors have already posted reviews in this thread. Including people who paid full price for the product. I have bought a few books earlier on facebook but each one was with the same information. But yours is completely different. I like it a lot and I am starting my new facebook page. Now I know what I have to share. Thanks for the valuable tips. I'm glad you like the report. Best of luck with your new Facebook Page! currently working on a project that will need some FB ads. when the time comes ill buy your wso. your sales page says $9.95 but when I go to the checkout it's $12.44? Just bought your wso ! The extra $2.49 is taxes (VAT) and depend on the country you are buying from. This is why I love the Warrior Forum. I hope that these reviews will help fellow warriors who are still on the fence. I was able to get a review copy of "FB Community Report Reloaded" to check out. The author packs a lot of really great information into this 73 page PDF in a well laid out, and easy to follow format. One of the main things I really liked was the suggestions on testing your ads. It had some ideas that I've done in the past, but haven't really explored too much because it takes time to test ads. This PDF strongly puts forth the importance of testing your ads, and gives some tips on what to test, and in what order. Plus, the testing plan the author explains in the PDF makes it easy to test on a small budget. Once you figure out which ad is a surefire winner, you can expand your advertising budget to make some serious money! The other thing I liked is how the PDF points out what you need to do in order to improve your ranking with Facebook's EdgeRank algorithm. While there isn't any way to know exactly how Facebook's EdgeRank algorithm works, this PDF does point out things you need to make sure you include within your Facebook fanpage posts, and what to leave out in order to improve your post's visibility on Facebook. Also, I found the tips on monetization of a Facebook fanpage to be really useful as well. Since people go to Facebook to hang out and socialize as oppose to shopping around for a good bargin on various products, it is important to know how to monetize your traffic in such a way that keeps high quality traffic coming to your Facebook fanpage. Overall a really great product! I went through it and this is a great resource for anyone that wants to start or improve their Facebook game. I have been doing FB marketing for quite some time and I have to say that I learned quite a few new things from this WSO. It is not a magic wand with which you will get hundreds of thousands of fans, but it shows you how to lay the foundation for such a fanpage and also the methods that you can use to get there. I think that I will start a completely new fan page to test this out on and if I do I will come back with any new results. But first I need to do a few improvements on a few of my main pages. I've just finished reading this report - and it was well worth reading. I've had Facebook pages in the past, and still have two today. After reading the first 20 pages or so I was already making changes to one of them, because it made me realize I wasn't doing this right... And I will surely apply the same techniques to the other page at some point. Even though FB ads are mentioned - and explained in a way a beginner can understand - you can use this report even if you don't intend to put money into FB ads, a lot of the strategies you are going to learn can be done for free. So if you plan on building a Facebook page or if like me you already have one or more pages that are not doing well, I guarantee you will regret neither your time nor your money here. I have received a review copy. Mathias is sharing his very successful strategy to create a Facebook page and get it noticed and attract many fans. His report is delivered in PDF format and is 73-pages in length. There are many screen-shots that make his A to Z step-by-step instructions easy to follow. Mathias also goes through how to monetize Facebook using many different options/choices. If you have been looking around the Forum for a solid guide ... Look no further. Bu following these procedures ... it is very likely for your FB page to go viral and be profitable. 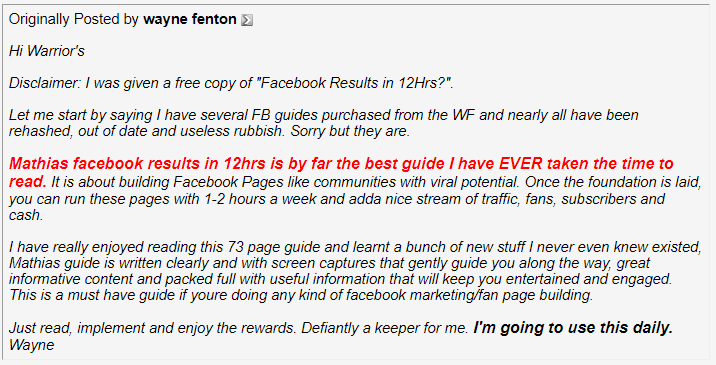 Disclaimer: I was given a free copy of "Facebook Results in 12Hrs?". Let me start by saying I have several FB guides purchased from the WF and nearly all have been rehashed, out of date and useless rubbish. Sorry but they are. Mathias facebook results in 12hrs is by far the best guide I have EVER taken the time to read. It is about building Facebook Pages like communities with viral potential. Once the foundation is laid, you can run these pages with 1-2 hours a week and adda nice stream of traffic, fans, subscribers and cash. I have really enjoyed reading this 73 page guide and learnt a bunch of new stuff I never even knew existed, Mathias guide is written clearly and with screen captures that gently guide you along the way, great informative content and packed full with useful information that will keep you entertained and engaged. 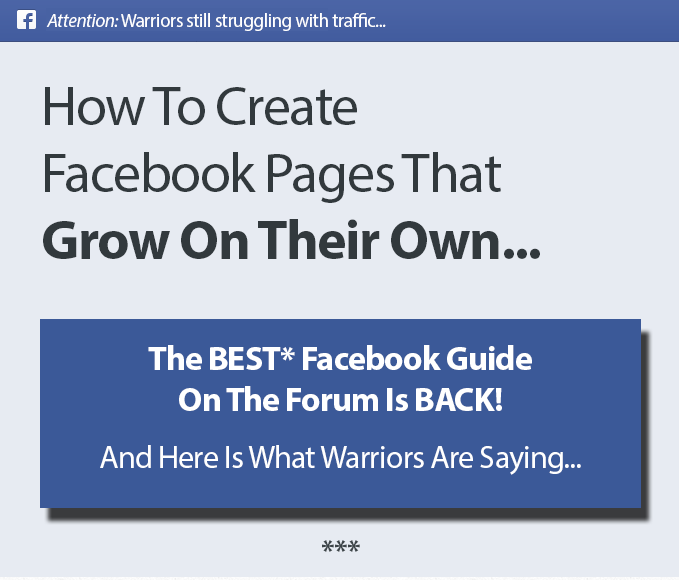 This is a must have guide if you’re doing any kind of facebook marketing/fan page building. Just read, implement and enjoy the rewards. Defiantly a keeper for me. I'm going to use this daily. 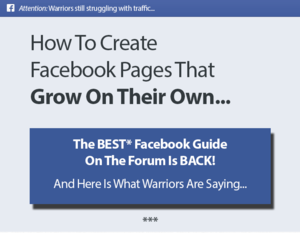 You can call it " fan page traffic encyclopedia"
This is a very well written and presented WSO that includes a multitude of information. No stone is left un-turned and if followed correctly, and actioned, you will see results as detailed in his sales letter. Whilst I have seen some of the information before, in various other WSO's, theres lots of golden-nuggets that I haven't, and these alone make it worth the price of the WSO. If you're already using Facebook, or have been thinking of starting this is a great WSO to pickup as its probably the most detailed and informative FB WSO I have picked up. I received a review copy and have spent some time browsing through this. This WSO is just over 70 pages and in not stuffed with pages of fluff and goofy pictures just to add to the page count. It is a well written, take you by the hand and walk you through the steps type of guide. Unlike a lot of reports that I browse through and then delete off my computer this is one I am going to go back to and follow through step by step with the WSO. Thank you for the feedback and reviews. Will these likes will convert . OR just my page will have 20000 Likes ,but nobody so much interested in the topics . I did Facebook advertising but I got lots of Likes but nothing is so much Converting . Will your course help anyhow ? I do talk about how to monetize your fans in the report. This is not about getting a lot of fans using sketchy or spammy methods. The fans you gain will be interested in your niche. Just wanted to know, has this got anything to do with getting traffic via reddit? So, any reviews on this course till now? I'm really looking to improve my Facebook reach and this just might be what i was looking for..but before jumping in, would be nice to see some reviews for this. There should be some reviews of the updated report very soon. No, this is about Facebook pages. Q: Does this work in my niche? This strategy works for all niches allowed on Facebook. We have used it in several, and our research is also based on some of most successful pages on the platform. Yes. We offer a 30-day money back guarantee. If you for some reason are not one-hundred-percent happy with the product, just send me an email and I will refund 100% of your investment. No questions asked! Q: How much do I have to spend after buying the report? Nothing if you don't want to. You can get started completely for free. The report covers free fan-generation techniques as well as paid ones. However, if you want to speed up your results, we recommend you are prepared to spend a bit on advertising. Q: Does the report cover X? In short, this report covers all the critical elements of building a successful Facebook page. Q: How long until I can see results?